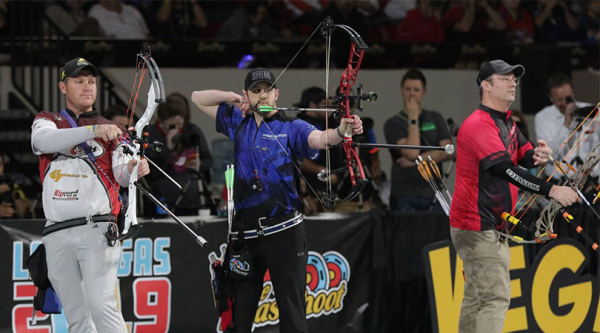 West Henrietta, NY – The year’s most anticipated tournament of the year wrapped up Sunday in Las Vegas, Nevada with record attendance and a record 24-man shoot down where Elite Archery’s Chance Beaubouef impressed with a second place finish. Shooting an Echelon 39, Beaubouef quickly led the way Friday with a perfect 300 26X, and improved on Saturday with a 300 28X. With competition heating up and several dozen with clean targets headed into the third day, Beaubouef held steady and dropped another clean round of 300 28X to earn his spot in the shoot down. While not his first experience in the Vegas Shootdown, the historic 24-man event proved to be an exciting challenge. In her second Vegas Shoot appearance in as many years, having won the Women’s Compound Open title in 2018, Alexis Ruiz proved her fortitude yet again. Finishing third for the weekend shooting her VictoryX, Ruiz put up impressive scoring from Friday through Sunday ending at 898 67X. Coming off an impressive win at the Lancaster Classic just weeks ago, Elite shooter Trevor Silverson, shooting an Echelon 37, quickly turned heads with this 900 72X and first place Young Adult finish on the weekend. Also shooting an Echelon 37 in the World Archery Indoor World Series Final on Saturday night was Victoria Balzhanova from Russia, who bested opponent Paige Pearce for the Gold medal finish.